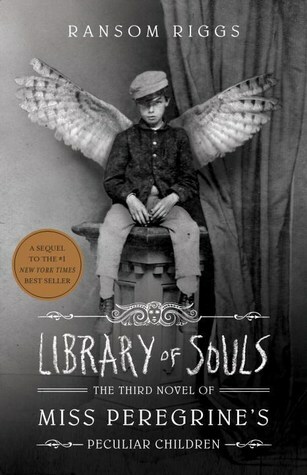 Library of Souls by Ransom Riggs is the final book of his Miss Peregrine's Peculiar Children series. As the story opens, sixteen-year-old Jacob discovers a powerful new ability, and soon he's diving through history to rescue his peculiar companions from a heavily guarded fortress. Accompanying Jacob on his journey are Emma Bloom, a girl with fire at her fingertips, and Addison MacHenry, a dog with a nose for sniffing out lost children. They'll travel from modern-day London to the labyrinthine alleys of Devil's Acre, the most wretched slum in all of Victorian England. It's a place where the fate of the peculiar children everywhere will be decided once and for all. 1. Riggs is a master of developing unique characters in his stories. Plus the amazing use of interesting pictures that he weaves into the stories makes them all the more intriguing. The story keeps me interested beginning to end, partly because I can't wait to see who Jacob and Emma will meet along their journey. 2. I love that this book shows more of the darker side of Peculiardom, and I am not just talking about the Hollows and Wights. Riggs takes this book through wehre the Peculiar's outcast and wanted live. It shows that not all Peculiar's respect the laws of Ymbrynes. Along with this, Riggs uses this book to explain the story of how Hollows and Wights came to be. 3. Jacob makes strides as a character in this book, both his personality and his powers. He learns just how powerful he is and how important he is in the war with the Wights/Hollows. He also learns how to be brave even when he is scared. Plus, the internal struggle whether to stay with Emma or return to his family makes him feel very human. 4. I thought that Riggs ended this series beautifully. The ending made sense, plus it did not leave me with lingering questions.